this yet another attempt to implement web interface component for foobar2000. Excellent component! This has been particularly useful for me as I tend to do the majority of my work on a different computer to the one on which my music is stored. It was getting tedious having to switch between computers to change songs or adjust the volume. Although I have only been using this component for a few days, I have a couple of suggestions for improvements that could be made (if they're possible). In any case, great work! I've already implemented "locate current track" button in the development version, I think "cursor follows playback" is only half-step ahead now. I'll add both issues on github. This is exactly what I needed! Thanks for developing this! The volume slider isn't entirely visible on my phone: it goes off-screen to the right. The playback order menu is called the "audio menu", it's confusing. Could there be a list of playlists in a menu? The horizontal tab list is often too narrow and scrolling through it is not optimal. In "touch mode" I still have to double tap a track to play it. Maybe this has another purpose? Hello, thank you for your feedback. I really appreciate that. It should be collapsible to a single button that reveals volume control on narrow screens. For very small resolution screens even that is not enought, I'll have to switch to small font size in settings. What is horizontal resolution of your phone? I'll check this. Maybe there is some issue with horizontal size breakpoints. Such issue exist on my list. I will implement this eventually. In "touch mode" I still have to double tap a track to play it. Double tap is intentional to prevent accidental playlist item activation when scrolling large playlists. I think single-tap activation is possible as option. Maybe this has another purpose? Currently it affects how playlist tabs work: in mouse mode they are draggable from any point, in touch mode there is a dedicated drag handle to prevent accidental dragging when scrolling. Yes I'm talking about that one. It pops up halfway off-screen when I click the volume button. My phone's screen is 768 px wide. Also I just noticed that the slider in the web interface is way more sensitive than the one on foobar's UI. When the web slider is at 50% the UI slider is at 20% or so. Probably a different scale is used. The total play time at the bottom always shows 00:00:00. Are you sure you are not confusing vertical and horizontal resolutions? 768px is a plenty of space. 338px and wider should look okay with small font size. Narrower screens cause buttons row to wrap. SDK provides range from -100 to 0 dB, web UI currently just represents this, probably standard UI uses logarithmical scale on top of it. I'll investigate this. Probably yes, I want to make proper playlist manipulation first, selection and especially multi-selection is somewhat non-existent in web interfaces and this has to be implemented manually. Definitely 768px (it's a Nexus 4), I'll post a screenshot as soon as it's charged and I can get it to boot again. I think it's 384x640 from web standpoint (at least this resolution is used by chrome dev tools). If you change font size to small in settings it should be enought still. I think a smaller text would be too small. Yeah, that's an expected behavior for now. I'll see what I can do. I can't add music derictories. This simply doesn't work. It always reset to С:\ instead of C:\Music for example and I CAN'T access folders from remote control, the C:\ derictory is shown but it doesn't allow me to open it. I need more info on this, e.g. OS version/bitness, foobar2000 version. Also please check if there are any errors in foobar2000 log or browser log. Should be working still, everything is UTF-8 internally, I'll check it. Doesn't work in fact. Ok! I would appreciate it. Okay, I've managed to reproduce this, seems to affect music directory roots only, not some paths under. Thank you. And a small interface problem - random folder icons disappear when exploring, and restored after page refresh. Fixed, would be available in the next release. What browser do you use? There are some issues with chrome refetching icons too frequently I did not manage to find a fix for this yet. I can reproduce your issue. It seems to be pretty similar to this bug. This is reported to be fixed already, but I still can reproduce it on chrome 69. It has something to do with caching, currently all static content is set to refresh immediately, I'll try different options and see if this helps. Probably a stupid question but here goes: Does this control music playback on the host machine or does the music play out of the machine accessing the web interface? 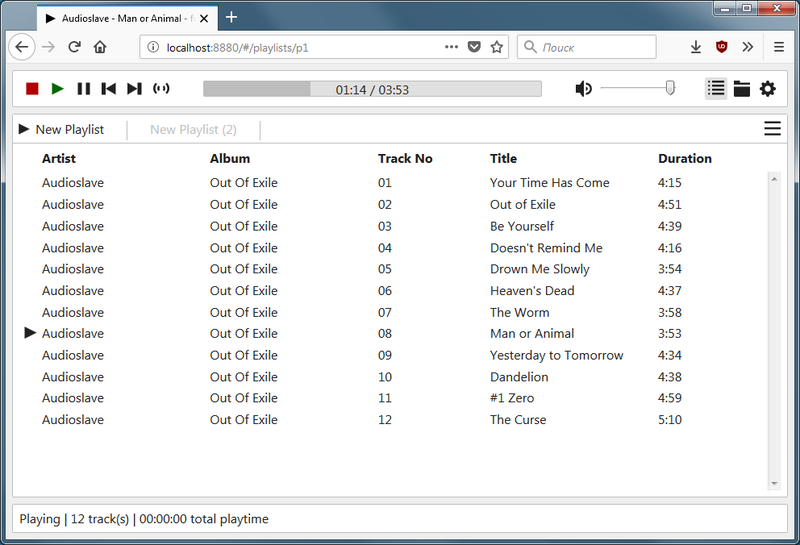 Music is played on the machine where foobar2000 is installed, web interface allows you to control this player from other machines. Actually your question isn't that stupid, I thought about supporting local playback, e.g. 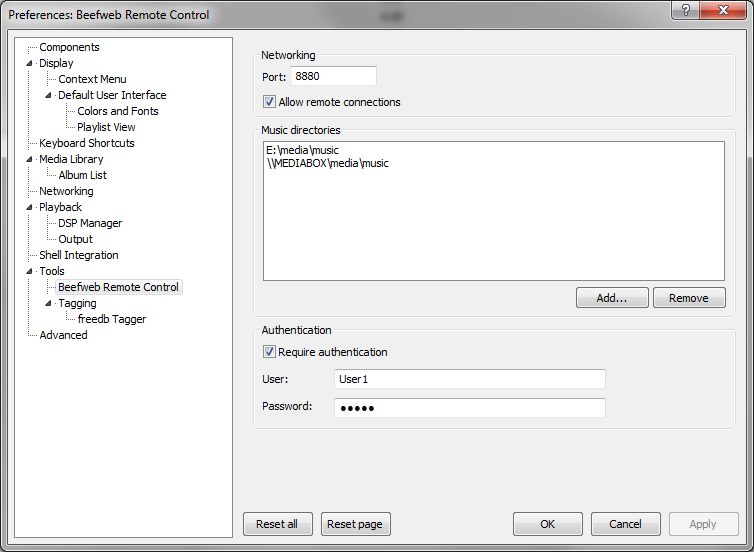 stream music from foobar2000 to your browser, but currently I have no plans to implement this until all remote control features are fully implemented.